Date/Time: Contact us for schedule and details. Description: Create a mobile-ready website, or turn your existing one into a mobile-ready, mobile-friendly, responsive website that displays beautifully on all screen sizes from mobile phones to desktops, without having to create an app or a separate website just for mobile. Learn to use Bootstrap, "the most popular HTML, CSS, and JS framework for developing responsive mobile first projects on the web", in one class a week. In this class, the instructor will go over general responsive design principles, with the primary focus on how to use Bootstrap, and get you up and running with a responsive webpage in the very first class. You will work with a project on your own laptop, and by the end of the course you will have made a completely responsive and mobile friendly website. This class assumes you know basic HTML and CSS. If not, please take beginner HTML/CSS class www.LRNGO.com/class/763 first as a prerequisite. Instructor Mandy Brake has 15 years engineering and coding experience, and has taught programming to many beginners who had no prior experience. She has built or modified over 100 websites, and is currently VP of Technology for LRNGO.com. Four classes of 1.5 hours each. Expected time outside of class: 1-2 hours/week. Must bring your own working laptop. Enrollment is limited to five students. Classes are offered through Teachers 2 Go LLC, a Houston education company providing classes since 2007 and A+ rated with the BBB. 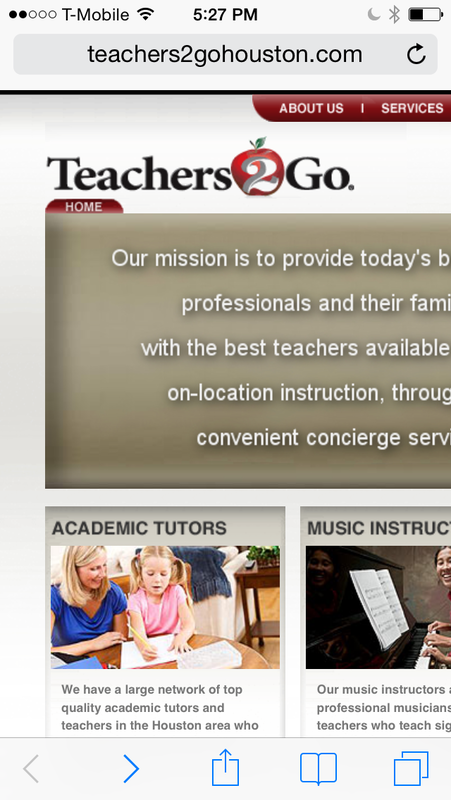 For more information or to register, press the button below or contact at www.TeachersToGo.com or call 713-789-2352.